How Does Psoriasis Affect Hair Transplants? At the True & Dorin hair loss clinic in Manhattan, the relationship between hair transplants and psoriasis often comes up during initial consultations with patients. We stress, first and foremost, that psoriasis does not lead to permanent baldness. 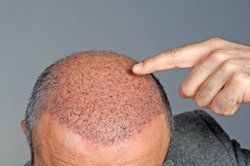 The skin condition is not responsible for permanent balding prior to hair transplantation surgery, and it will not result in the permanent loss of transplanted hair after surgery. That said, it is best to treat patches of psoriasis before a patient undergoes hair transplantation surgery. While hair transplants will not worsen the condition, the presence of psoriasis can make the hair transplantation recovery period less comfortable than it would otherwise be. The frequent scratching associated with psoriasis can interfere with healing of the scalp. It is also best to avoid having to make incisions in skin affected by psoriasis or any other skin inflammation, either in the donor or recipient areas. Fortunately, there are several effective methods of treating psoriasis. Before dealing with the relationship between psoriasis and hair transplantation, it is important to understand what psoriasis is. Psoriasis is a chronic skin disease that, while treatable, cannot be cured. Most cases of psoriasis are relatively mild, if annoying. The condition results in thick, red patches on the skin with silvery scales. These patches are often quite itchy and, in severe cases, painful. Often, psoriasis is not confined to the scalp, but also present on the elbows, knees, soles of the feet, and other areas of the body. Anyone can get psoriasis, and the patches may appear to get better only to return, especially in dry weather conditions or due to the presence of infection in the body. If patches of psoriasis are present on the day of your surgery, our hair transplant surgeons will attempt to work around these patches if possible. However, the presence of psoriasis will not necessarily have any effect on the short- or long-term outcome of your hair transplantation. It should be noted that the presence of scaly, red patches of skin may not be indicative of psoriasis, but of some other scalp condition. In assessing your candidacy for hair transplantation, we will thoroughly examine your scalp and advise you of its health and how it could affect your results. To learn more about the relationship of psoriasis and hair transplantation, or to schedule your initial consultation at the True & Dorin hair loss clinic, please contact our hair restoration experts today.